Here are some pictures of people throwing things in Olympic events. The first one shows a man throwing a hammer and the second shows a man throwing a discus. They can throw them a long way. 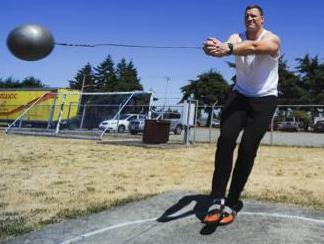 A recent Olympic record for throwing the hammer was about $80$ adult paces and for throwing the discus was about $70$ adult paces. How far can you throw a beanbag? Can you throw a beanbag $70$ paces? Can you throw a beanbag $80$ paces? Comparing and Ordering numbers. Odd and even numbers. Sport. Place value. Length/distance. Addition & subtraction. Time. Interactivities. Area - squares and rectangles. Mass and weight.